Good camping skills: Good camping skills rule! They are far more important than the weight of my gear for keeping me safe, warm and dry. And I don’t mean fancy skills—just the basic, garden-variety skills that every backpacker probably knows how to do (or should know)—like putting on rainwear or a warm jacket when needed, selecting a good campsite, and doing a decent job of pitching a tarp or pyramid shelter, etc. Light gear appropriate for the conditions: I pick the lightest fully-functional gear appropriate for the actual conditions I backpack in. E.g. my light down sleeping bag/quilt, down jacket, and 6-8 oz rain jacket work as well as conventional (heavy) gear at 3 times the weight. I take gear that is appropriate for actual conditions for the time of year and location I am backpacking. E.g. I don’t take a 4-pound, 4-season dome tent, a +20F sleeping bag, and a down jacket for a warm May trip on the Appalachian Trail with expected lows in the 60s—you’d be surprised how many people do! Nutritious high-calorie food: Intelligent selection of my food, gives me 3,000 nutritious and filling calories of complex carbs, protein and healthy fats for around 1.5 pounds/day. 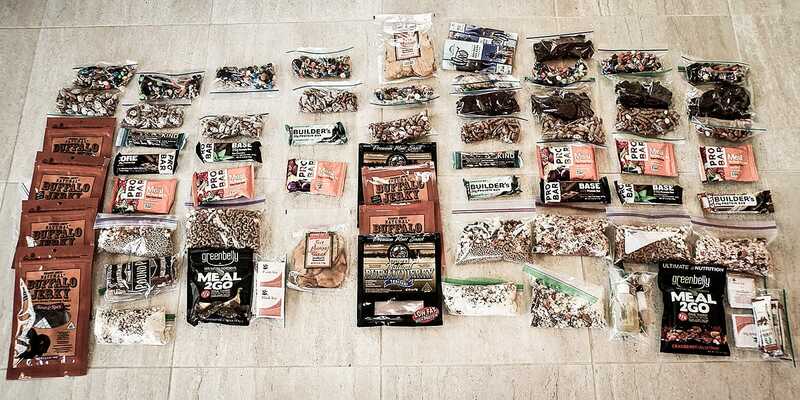 This is the same number of calories provided by 2 pounds of average backpacking food. Over a 3 day weekend backpacking trip I get as many calories and as much nutrition, possibly more than someone carrying almost twice the food weight. Good campsite selection: While I had the opportunity to camp higher up on the canyon wall on a slickrock shelf with great views, I chose to camp in a warmer and more protected location in the trees. And discreetly camping out of sight, away from the trail and in the trees is a favor to others sharing the canyon with me (Note that one tarp ridgeline is solidly anchored to a cottonwood). Be solid on this before your trip. It’s not rocket science. Anybody can pitch a tarp or pyramid shelter with just a bit of effort. Read and follow the manufacturer’s instructions. They are likely excellent. Setup your shelter in the backyard, or nearby park/playing field a few times before you go. If you are backpacking with a partner do this together. You should be able to easily pitch a tarp or pyramid shelter in 3 to 5 minutes. For a basic tarp, there’s no need to get fancy. An A-frame pitch between two trekking poles (or better, two trees) will work fine 95% of the time. In strong winds, pitch it lower to the ground and flatter. Orient your shelter to the expected wind direction. Orient tarps with the narrower/rear end low and into the wind, pyramid shelters/tents with the door facing away from the wind. In very strong winds, use the the additional tie-out points on your shelter. Use sturdy Y-stakes. They have great holding power, and you can pound them into rocky ground. Always carry 1-2 spare stakes and a few hanks of spare cord. Shelter cord adjusters can slip. Know a few basic knots and guyline management—a figure 8 loop at the end of a line, girth hitch and a trucker’s hitch for guyline tension adjustment. Moderate but consistent movement (it needn’t be at all tiring or strenuous) is the key to keeping warm when it’s really cold. Even walking 1 to 1.5 miles per hour should keep your internal, metabolic heater going, and keep your hands and feet warm. If you are getting tired you are going too fast! Minimize stops to essential needs, and don’t make them longer than necessary. You get cold quickly, and it takes a long time to warm up again. If you’re starting to chill it’s time to move. If you really need to stop for a longer time (over 5 minutes), try to do it in a warmer, more protected area and put on warm clothing (e.g. down jacket) as soon as you stop. Take your warm clothing off just before you start hiking again. Put on just enough clothing to keep you warm when moving. Overdressing, getting hot and then sweating out while backpacking ultralight is a great way to get wet and then really cold. It’s very easy to get clothing wet, but it takes a long time to dry it out in cold and damp weather. Wet clothing is cold clothing and unhappiness. Only add warmer clothing when you can no longer stay warm walking at a comfortable pace. Keep your gear dry: The best way to keep your gear dry is not to get it wet in the first place—especially your down bag, and down jacket. A Cuben Fiber backpack, with a roll top closure and sealed seams combined with stowing your sleeping bag/quilt and down jacket in Cuben Fiber stuff sacks is a great way to keep your gear truly dry. I am going to be blunt. Some gear is outright better than other gear. My light/ultralight gear, by almost every measure, outperforms the similar conventional (heavy) gear recommended by “trusted experts.” E.g. compared to a 2½ pound synthetic bag rated to only +30; my one-pound, down quilt rated at +20 F is almost ⅓ the weight, warmer, far more compressible, and will last years longer. That is, I am warmer and more comfortable for ⅓ the weight. Even the cost is not much more; $250 for my down quilt vs. $160 for the synthetic sleeping bag. 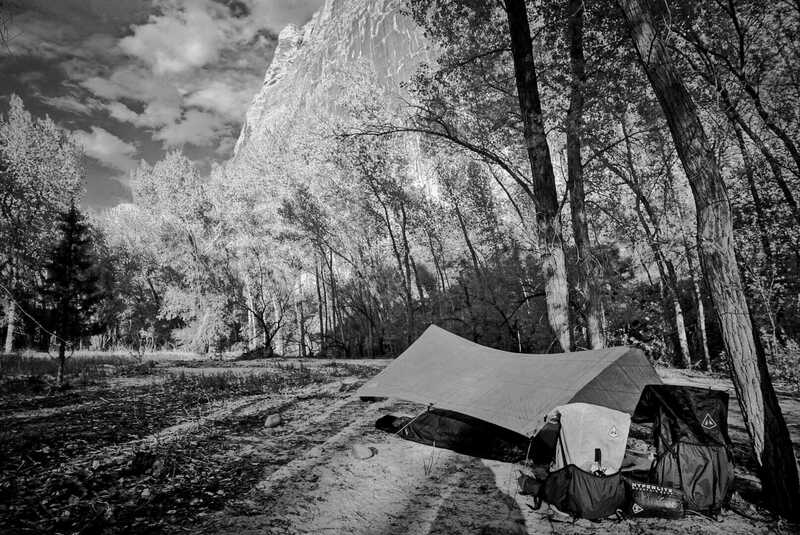 Your tent just keeps the wind and rain off—so will a tarp or pyramid shelter. What keeps you warm is a puffy down sleeping bag and jacket. Down is your best friend when it comes to staying warm. At a minimum get a good down sleeping bag (or quilt), and a down jacket. Don’t believe the dire warnings about getting down wet—it’s really hard to do. In over 40 years of backpacking all over the world in all sorts of conditions, I have yet to get my down so wet that it didn’t do a good job of keeping me warm. New water resistant shell fabrics and water resistant down only improve upon this. The only advantage to synthetics is price, and then only in the short term. In the long term I find they usually lose loft after less than a season of use. This makes them a poor long term value. A good down bag will easily last 5 to 10 years. And make no mistake, a wet synthetic sleeping bag or jacket is no joy! Keeping your gear dry is a better strategy for both down and synthetic gear. I bring a sleeping bag (or quilt) rated for the average expected low temperature for the area and time of year I am backpacking. If I get a period of unexpectedly cold weather (it happens), I supplement my sleeping bag with my fleece mid-layer, down jacket, wam hat (and down pants and booties if I have them). 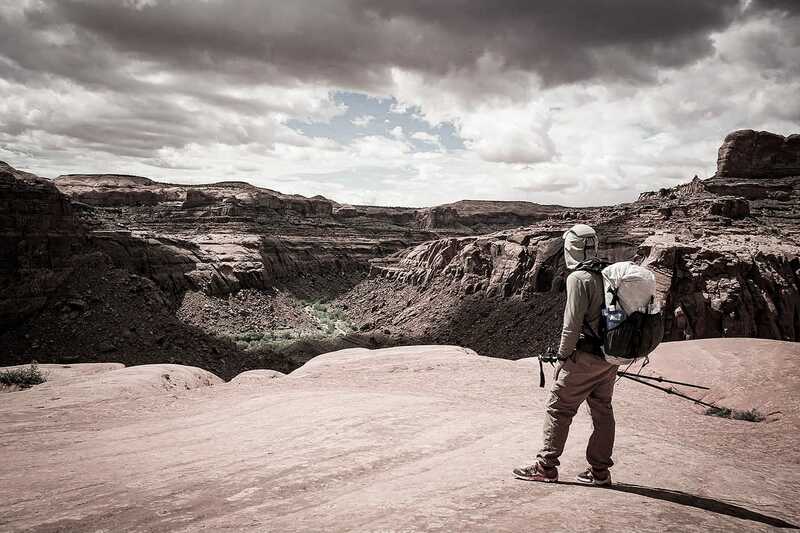 Your money and gear weight is better spent on buying a warmer down bag and jacket. Or even down pants, down hat and down booties. The NOAA hourly weather graph is among the most informative and accurate. Then pack for those conditions! Since 90% of backpackers take 90% of their trips for three days or less, this weather report should be quite accurate for the short time you are out. This will let you pack a shelter, clothing, and sleeping bag appropriate for actual conditions. It will also deter you from taking fear-based, “what-if-the-worst-happens!” gear, e.g. a 6 pound tent, a +10F sleeping bag, and a down jacket for a warm weather trip on the Appalachian Trail. For longer term gear planning there is historical average weather Data on Accuweather which will help you intelligently select gear months before your trip. In summary: the historical average weather will assist you buying gear in advance of your trips (20 degree vs 40 degree bag, etc.). And just before your trip, the 3 day forecast/NOAA hourly weather graph should help you fine tune the gear you actually take. The best way to keep your gear dry is not to get it wet in the first place. This means putting on your rainwear before you get wet. Not sweating out your clothes with perspiration while hiking. And keeping the gear in your pack dry (especially your down bag, and down jacket). A Dyneema® Composite Fabric (formerly Cuben Fiber) backpack, with a roll top closure and sealed seams is a great way to keep the contents of my pack dry. When using the pack in conjunction with stowing my sleeping bag/quilt and down jacket in DCF8 Stuff Sacks, I don’t need to do anything different when it rains; I can just keep hiking. So my backpack is always packed the same, regardless of weather. No messing around taking on and off pack covers (imperfect rain protection anyway) or fussing with pack liners, both of which are a pain and waste of time. If rain is possible, keep your rainwear quickly accessible in an outside pocket of your pack (I use the center rear pocket). 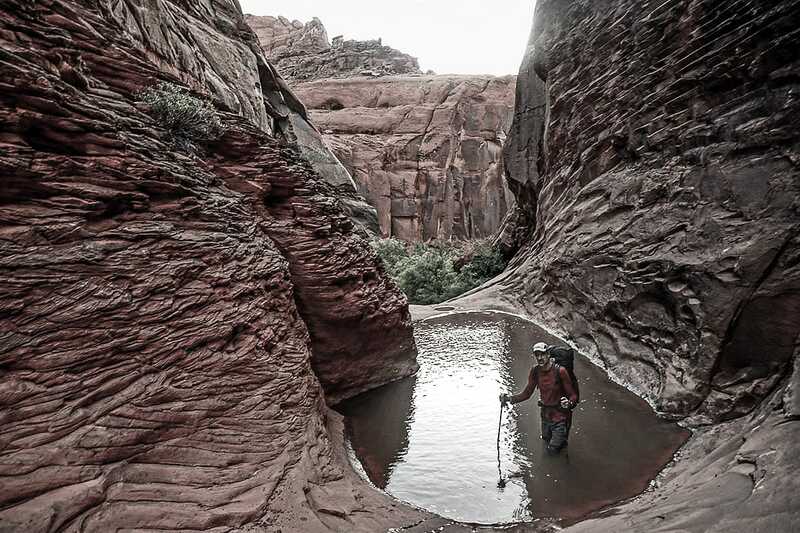 That way you can put it on quickly, and not have to expose the main pocket of your pack to rain. A tarp or pyramid shelter may be drier than a tent: Many times the small, confined, and less ventilated area inside a tent can be wetter than a larger (and much lighter) pyramid shelter or tarp. This is also a recommendation to buy the larger tarp or pyramid shelter. For just a little more weight you get a lot more living space! Condensation is a big problem in small tents. It’s very easy to get your gear wet from the high humidity inside. In tight quarters it’s almost impossible not to brush your sleeping bag or down jacket against condensing tent walls. And if you happen to get into the tent with wet gear it is unlikely to dry in the humid climate. In contrast, a tarp or pyramid shelter might have twice the room and be better ventilated and less humid. And if you’re stuck in the shelter for an extended period of time, you’ll welcome the larger and less constricted living area of a large tarp or pyramid shelter. 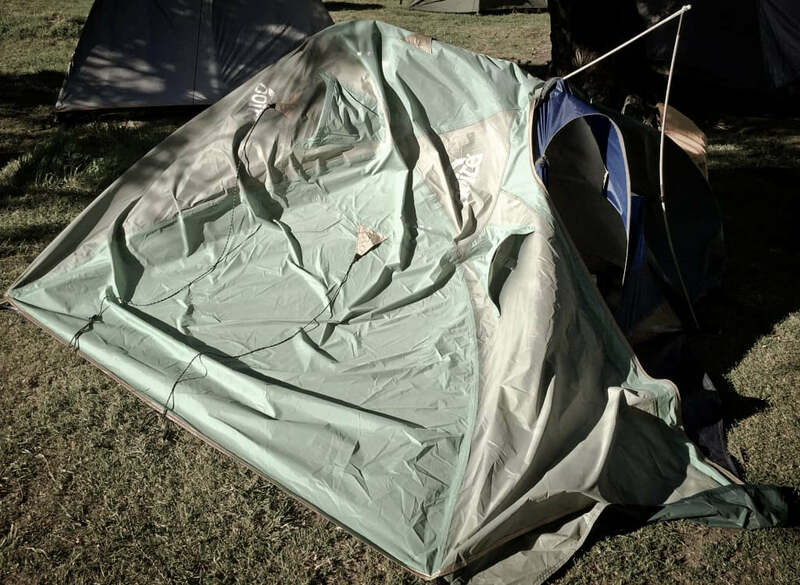 During long rains, small backpacking tents become more like coffins than dwellings! Healthy and satisfying food for less weight: My nutritious and high calorie Backpacking Food gives me 3,000 healthful and filling calories of complex carbs, protein and healthy fats for around 1.5 pounds. This could save me as much five pounds or more of food on a trip vs. a typical backpacker’s food. You can save a lot of weight and even money by selecting the right backpacking food. My nutritious and high calorie Backpacking Food gives me 3,000 healthful and filling calories of complex carbs, protein and healthy fats for around 1.5 pound/day. Over a 3 day weekend backpacking trip I get as many calories and as much nutrition, possibly more than someone carrying almost double the food weight. Try to get the most calories per unit weight in your food but not at the expense of a poor diet. You want a balanced diet with good protein, carbohydrates, healthy fats, fiber, vitamins and other nutrients. I take unsweetened, unsulfured dried fruit, freeze dried vegetables, nuts, homemade gorp, whole grain crackers, whole grain pasta, healthier-higher-calorie trail bars, and lean jerky and powdered milk and powdered soy for my protein. See my Backpacking Food Page for more examples of healthy backpacking foods. The standard advice to carry an extra day of food is hooey. I figure I can make it at least 3 days without any food. I’ve had to do this before and feel comfortable with my choice. Some mainstream outdoor training courses (NOLS, Outward Bound) have two to three food-less days in their programs. This is not a recommendation for others to do the same. You’ll have to make your own decision on extra food. Maybe you will just bring a bit less extra food next trip. Again, think carefully about packing for “the worst case scenario”. “Skip” one day of food: I eat a big breakfast or lunch before I start hiking the first day and I eat a big meal when I get out. By boosting my off-trail calories on the first and last day I eliminate carrying a whole day’s worth of food in my pack. So for a weekend trip (three days and two nights) I might carry 3.4 pounds or less of food. Drink when thirsty and carry less water: I carry only the water I need to meet my thirst. This means I rarely carry more than a liter and usually a lot less. “If you are thirsty, it’s already too late” and “If your urine is yellow, you are dehydrated,” are myths! My article The Best Hydration – Drink When Thirsty is based on the current best science (from experts in the field of sports hydration not beholden to sports drink and bottled water companies). It suggests that “drinking to thirst” is the safest and healthiest strategy for hydration during exercise. It turns out that your body’s natural thirst mechanism works well to keep you hydrated and healthy during exercise. In fact, the amount of water your body requires is probably far less than what the Sports Drink and Bottled Water companies have been telling us. Put a little faith in yourself and your gear and go lighter. Alan grew up in northern California and spent his formative mountaineering years in Yosemite and the Sierra Nevada. At age five, he carried his own backpack into the Yosemite backcountry. In the ensuing 50 years he’s climbed and adventured in North and South America, Europe and around the world. Somewhere in there he was part of the initial ultralight backpacking movement and co-founded Backpacking Light.